This is a simple and tasty way to dress up peas. Melt butter in frying pan and saute' onion, celery, and red pepper. Microwave peas with sugar (if using) until tender, or heat in a small amount of water on the stove. 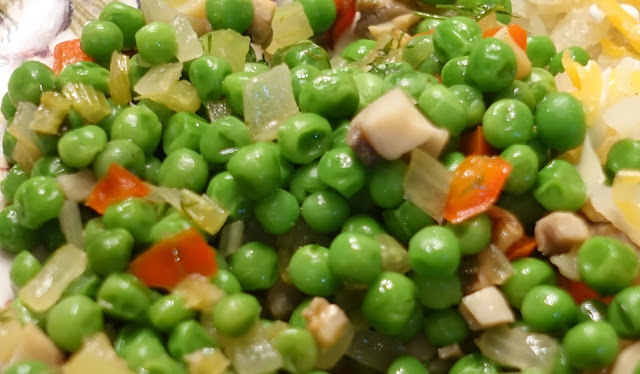 In serving bowl, toss peas with saute'ed vegetables and a bit more butter and serve. A unique twist and it sounds delicious! I've always liked peas but they can be boring. This peps them up a bit. Another nice "pepper upper" is to add some chopped fresh mint. Yep - that sure makes the peas liven up! Looks so appetizing as well. I love peas and this looks really good! Never thought to add a bit of sugar to them when cooking. I must give this a try! Thanks for sharing! We like green beans cooked this way but I never thought of doing peas this way. Sounds delicious!